Did you know that smartphone users outnumber hungry children by 20-to-1? That makes one wonder: if there was something that all smartphone users could do to help feed the hungry children of the world, wouldn’t that be great? 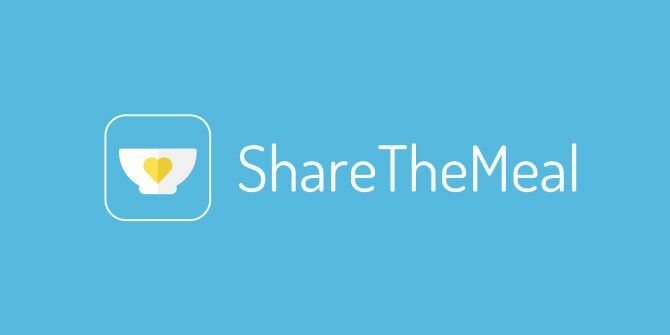 As it turns out, there is in the form of an app called ShareTheMeal. This app allows users to tap a button on their screen and donate as little as $0.50 to help feed a single child for a day. And it’s run by the United Nations, so you know you can trust that your donation won’t be snatched by a scammer. To use the app, download it from Google Play or the App Store. From there, you can choose to connect it with Facebook Thousands Gave Away Personal Data for Free on Facebook - Did You? Thousands Gave Away Personal Data for Free on Facebook - Did You? If you're like thousands of other people, you just gave away a ton of personal information, for a graphic that shows your most-used words on Facebook. Not really a great trade, was it? Read More (entirely optional) or you can just click Done on the top of the screen. In the middle of the screen, you’ll see a button labeled Share The Meal. Click that and you’ll be taken to a screen where you can choose how much you want to donate and enter your payment info (PayPal is a valid option What Is PayPal Credit and Where Can You Spend It? What Is PayPal Credit and Where Can You Spend It? What exactly is PayPal Credit? Here's how PayPal Credit works and whether it's the right payment option for you. Read More ). Presumably, the UN does this to avoid a portion of the donations going to Apple or Google through in-app purchases, thus allowing more money to actually go towards feeding the kids in need. Outside of actually making donations, you’ll also find info on how many meals have been provided with the app, the goal, and some info about the organization and what they do. It’s all super easy to use, and it’ll make you feel good to know you did something nice around the holidays, even if a single $0.50 donation is all you can afford. Are you going to donate through this app, or do you have any other awesome charities to recommend? Share in the comments!